SUMMARY: Using custom builds in its EPIC® EHR, Bon Secours Health System has developed sophisticated reporting, patient registries and a predictive model to identify high-risk patients. Their RN case managers, also known as nurse navigators, use tools like registries inside the EPIC platform. We wanted to identify the workflow for a nurse navigator. "Where does the nurse navigator spend their day? Certainly on transitions of care. They look at post-hospital discharges, emergency room visits, moving into hospice or palliative services, or even to short-stay skilled nursing facilities. If an individual identifies as having lack of resources then we’re going to look at a tool where those obstacles or barriers to care are identified, as well as a tool that can be used to connecting people to those resources that they need. When a person has multiple comorbid conditions, that’s a more complex patient who's going to require much more intensive management  if they have gaps in care, they’re not adherent to a plan of care, they have chronic pain, frequent visits to the emergency room, etc. That’s where the care coordination and nurse navigator’s activities are focused on." 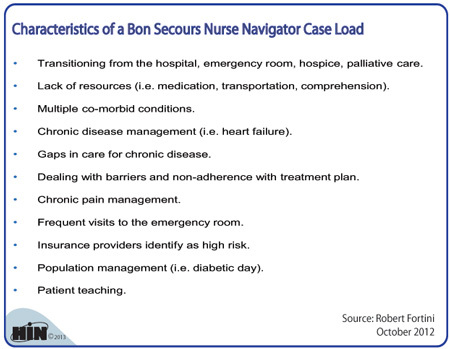 During this 45-minute webinar, Robert Fortini, vice president and chief clinical officer at Bon Secours Health System, drilled down on Bon Secours' tools and protocols for data analytics in improving population health management. Improving Population Health Management Through Effective, Efficient Data Analytics is available from the Healthcare Intelligence Network for $129 by visiting our Online Bookstore or by calling toll-free (888) 446-3530.